For deep wet scrubbing or light stripping. Aggressively removes dirt and scuff marks from heavily soiled floors. Use with a cleaning solution to scrub hard floor surfaces. 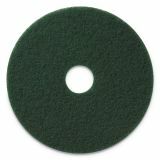 Americo Scrubbing Pads, 17" Diameter, Green, 5/CT - Use with a cleaning solution to scrub hard floor surfaces. This pad will aggressively remove dirt and scuff marks from heavily soiled floors. It is also designed for light stripping. For use on standard electric floor machines or automatic scrubbers. Ideal for use on machines speeds up to 350 rpm.